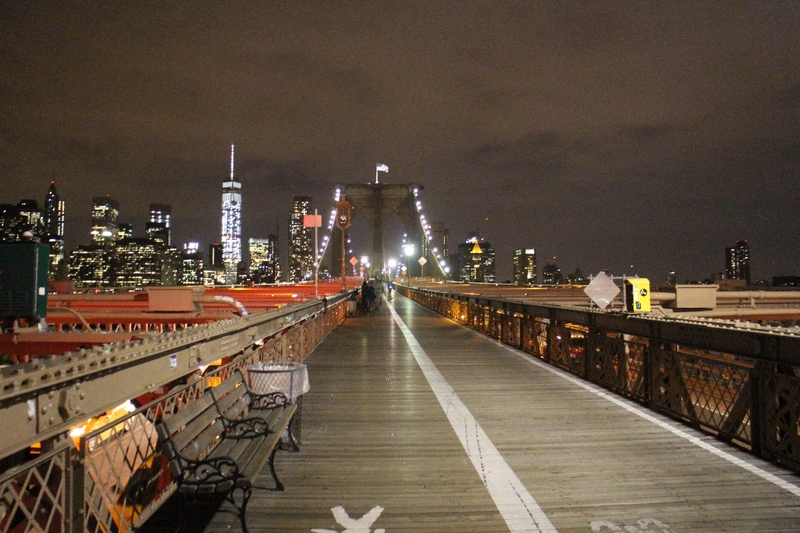 As one of the world’s most visited cities, New York City (NYC) remains an irresistible draw. Often overwhelming, it’s full of surprises at every turn. Here are some advices that will help first time visitors keep a cool head and avoid common pitfalls while discovering the best of what this magnetic metropolis has to offer. We took 10 full days to see everything – and by everything I mean all tourist attractions (Empire State Building etc.) and those less known places. I had a list of all things we must see, however more things were added while there, some were skipped and we never knew more day a day in advance what we were going to do (weather in October can be unpredictable). The main rule was to do 3 things per day – sounds reasonable, right? Not so much. There were days when we did one thing and then those when we had to do five. Get CityPASS and save tons (by the way, I’m not sponsored). Just a little under $80, to be specific. It’s free, just avoid rush hour trips because the ferries are packed. Not a good time to take a leisurely ride. We caught one around 4pm and it was great. A different way to see iconic Manhattan and Jersey city skyline. Visiting New York City and not seeing a show on Broadway would be just wrong, don’t you agree? However, with the city itself being so expensive, you’ll soon find yourself searching for new options to save some dollars. Or maybe you have the whole list of shows you need to see. 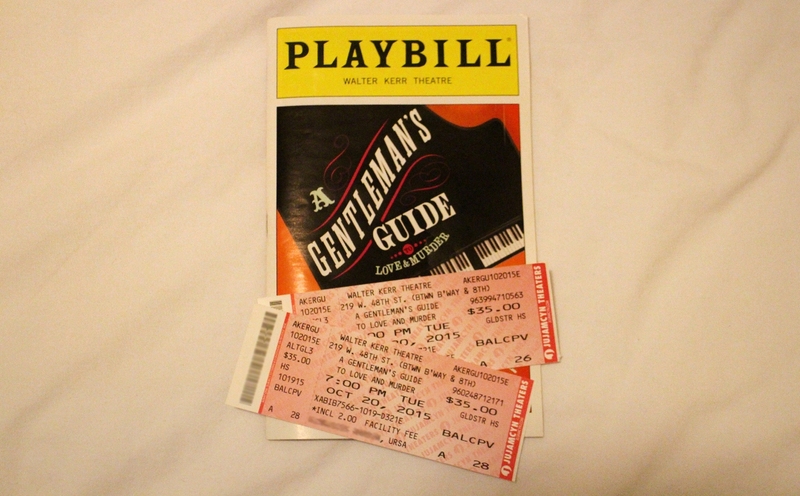 When I was there, I choose a comedy called A Gentleman’s Guide to Love and Murder and it was fantastic! Jefferson Mays amazingly portrayed 9 different characters, songs were extremely catchy and the plot was ridiculous. Unfortunately, the final performance of the show on Broadway was January 17, 2016. The price we paid was $42 per person, all fees included. We bought our tickets on Goldstar, a reliable website that offers discounted tickets for various events. The discounts are typically 20-50% and they also have off-Broadway offerings. The great thing is you can buy them last minute, if still avaliable. We bought ours a day before the show. If you want a list of all shows currently played and you wish to know what’s the lowest price you can get, visit Broadway For Broke People. As you can see, they are mentioning “Lotery”, “SRO” (meaning standing-only) and “Rush” tickets. Many Broadway shows have implented these kind of tickets to make tickets more affordable. Let’s start with so called Lotery tickets. This means you have to go to theater earlier (read policy of the show you’re interested in for the exact amount of time, the avarage is around 2 hours before the show). Names are drawn at random and you have to physically be there to claim them, if you score. Rush tickets do not require as much luck, but you still have to be organized. They sold first come, first serve when the box office opens. Queues can get quite long, so try to google a little to see how popular the show is and when it’s the best to get there. And lastly, Standing-only tickets. There are numbered spaces that are the width of a regular seat, usually located at the back of the orchestra. The disadvantage is, they’re only sold when the show sells out, so keep that in mind. Note that all Student Rush ticket purchases require a valid and current student ID and Lottery Rush ticket purchases require a photo ID. Some theatres may not accept cards, so take some cash with you.